In this tutorial, I'm going to be explaining the topic of collision. However, before we can get into collision, I'm going to need to show you some physics bodies and how they work. First, we're going to need to make some adjustments to our project file. Let's delete the player node by selecting it, pressing the delete key(or right clicking and selecting "Delete Node(s)") and selecting "Yes". Next, let's add a KinematicBody2D to our project. Though this is the first PhysicsBody we're using, it definitely won't be the last. Make sure it's a child of our tree root, and call it "player" just like our previous Sprite node. Now, we can add another Sprite node as a child of this one. Make sure our new player node is selected, and add a Sprite node. 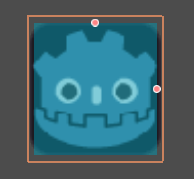 Give it the Godot mascot texture(icon.png) as we did in Part 2, but don't give it a script. We're going to be giving the script to our KinematicBody2D node. Otherwise, it'll throw an exception since our KinematicBody2D does not extend Sprite. One more thing to add is a CollisionShape2D. As I'm sure you can guess, this is the part that handles collision. It only works when it's a child of a PhysicsBody, but it'll give you a handy warning should you try anyway. Add the CollisionShape2D as a child of our "player" node, and look down to the Inspector tab. In our "Shape" property, we can select a number of shapes to use. For now, let's go with the standard RectangleShape2D. In the scene view, zoom in on the Godot mascot and you should notice a blue rectangle with two orange dots on either side. Drag these so that the blue rectangle covers the entire Sprite. In case the blue rectangle is bugging you, you can select the eye icon next to the CollisionShape2D node in the scene tab to hide it. Another thing to note is that all children of our new player node should have their position property set to (0, 0) in the Inspector tab, since this position is relative to the parent. Now that we have all this set up, let's move our "player" node(not the Sprite!) somewhere into the visible game window and run our project. With any luck, it appears exactly the same as it did in the last tutorial, minus the movement controls. Jeez, great job Alex, you taught us to do literally nothing! That's where you're wrong, uninformed yet indignant reader. This appears the same since we have effectively the same Sprite object, but we have made some large changes in the internal logic of our game. Let's get ourselves back up to where we were in Part 4 with the functioning movement system. KinematicBody2Ds don't have a set_pos() function, so we're going to have to change our approach slightly. Instead of set_pos(), we can use the slightly nice "move()" function. move() takes in a Vector2 argument, where the X and Y are coordinates relative to the KinematicBody2D we're moving. In short, this means that doing move(Vector2(1, 0)) would move our KinematicBody2D by 1 unit in the X direction. You've probably noticed here that I'm using SPEED*delta instead of a numerical value for the amount that I want to move the player. As explained in Part 3, delta can be used to ensure a consistent speed despite variable framerates or processing speeds. This is exactly what I'm doing here. I've defined the variable "SPEED" at the top(it is global and other nodes can access it but we'll deal with that later) and then I've varied the amount that the player will move by a factor of delta. Okay, so now let's add a wall. 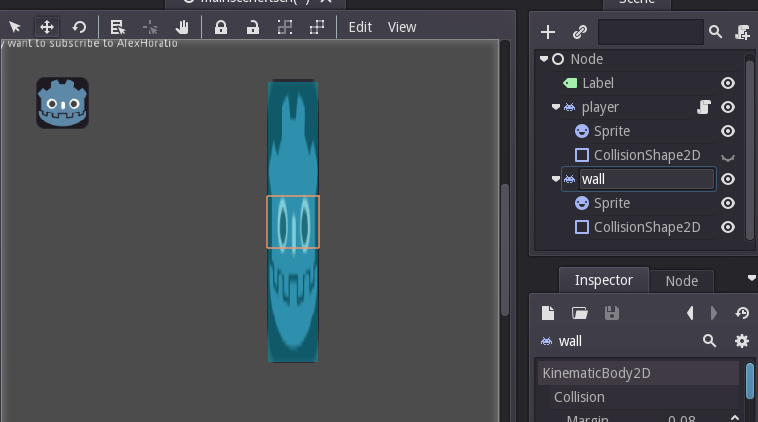 Since it's too much effort for me and probably for you too at this stage to draw up a beautiful wall texture, I'm going to re-use the Godot mascot icon. Having said that, if you want to use a beautiful wall texture, be my guest. 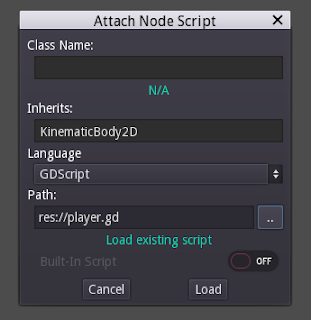 Create a new KinematicBody2D as a child of Node. Then, give it a Sprite object and load your desired texture. If you're like me and you want to use the Godot mascot again, it might help to stretch out the Sprite a bunch using the orange dots when you have the Sprite node selected in order to make it at least representative of a wall. Next, give your KinematicBody2D a child of type CollisionShape2D and adjust it to fit the Sprite. And that's all you need! Now you can launch your game, move your protagonist directly into the wall and watch as they are valiantly prevented from moving through it. No code required! Well, not for the collision bit, anyway. I'd encourage you to experiment with RigidBody2D too, since this one responds to physics in a more classical way. It bounces, it rotates, and it is affected by gravity. All of this can be tweaked under the "Inspector" tab. You're almost ready to make a real 2D sidescroller, we only have a few topics left! How exciting! However, don't expect that the tutorials are going to stop then- it's going to get intense. Thanks for reading! Stay tuned for Part 6 on the topic of intersections and instancing! I've been wanting to get into Godot for a while now, but none of the available tutorials I found explained things all that well. I'm really liking your tutorials and how simple it makes things to understand. Damn, you're absolutely right. Thanks for the correction!! It seems the godot updates mean we have to do move_and_collide instead of move in the code. There are two possible functions, move_and_collide or move_and_slide. move_and_collide works. Move and slide doesn't! Who the hell is Missy? Why am I not making games right now?